It was probably in 1989 that I got a chance to work with computers. Our school had one of those machines (don’t remember what it was!) which came with pre-installed BASIC interpreter. Two things stand out in my mind – it had a color display and I could program games in it! From the very first day I was hooked on to computers thanks to the power and the fun offered by BASIC language. Later we (me and my brother) ended up creating some fairly sophisticated games using QuickBasic compiler. However once I got a job all these hobbies went in the background and I was programming in Java from the beginning. Once in a while I used to read our old basic programs which brought back the memories of fun we had with the language. Unfortunately BASIC compilers were no longer bundled with Windows and the only way to have fun with the language was to install a DOS emulator such as DosBox. I resented Microsoft’s decision to remove BASIC language from their Windows products. Then in October 2008, Vijaye Raji (a Microsoft engineer at that time) came out with a scaled down version of Basic language called Small Basic. It had brought back the fun and the hobby of programming! Small basic is suitable for introducing a programming language to kids. It is also a hobbyist language since you can quickly create powerful programs using it. If you already know programming, it takes just an hour to learn the language! In 2006, Salon carried an article titled “Why Johnny Can’t Code?”. According to the author (David Brin), kids today had no easy way to learn about programming. We had BASIC during our childhood days and today’s kids had C++ and Java which was tough to learn. Also BASIC was synonymous with FUN! A simple yet powerful API to make programming fun! Initial release of Small Basic (0.1) was in October 2008 and Small Basic 1.0 was released in 2011. Small Basic 1.0 supports 20 languages. 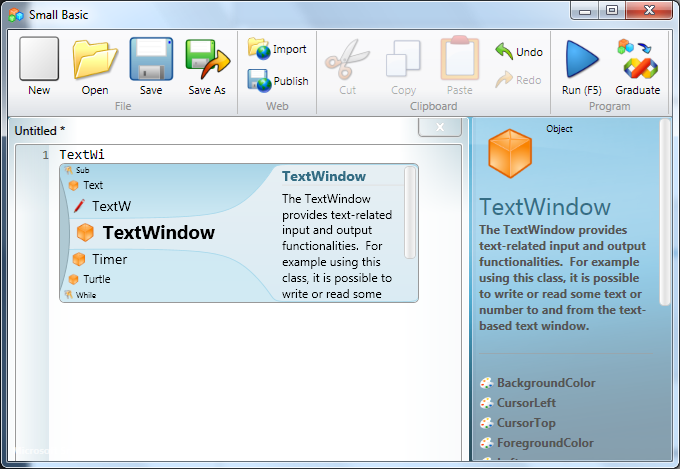 Small Basic can be installed on Windows XP, Windows Vista or Windows 7. It requires .NET framework 3.5 to be installed on your system. Windows 7 contains .NET framework and for Windows XP, you can download it from here. The small basic IDE is composed of 3 panes. The top pane is the toolbar, the left pane is the editor and the right pane shows context sensitive API documentation. Also note the cool intelli-sense window overlapping the editor window. If you press “Control” key while the intelli-sense popup is shown, it becomes semi transparent. Try it! Web – You can now publish your small basic programs to the cloud! The program is uploaded to www.smallbasic.com and you can run on a browser if silverlight is installed. It is also possible to open a program already published on www.smallbasic.com from the small basic IDE. Clipboard – Standard copy/paste operations. Program – You can run the program or convert your program to visual basic. For beginners in programming, it gives a roadmap to Microsoft visual studio express and visual basic. When you run a Small basic program, it is first compiled into a .NET program. This .NET program requires .NET framework 3.5 installed on your system to work. Small basic is an imperative language with a very small set of keywords (14 in total). It has a dynamic type system, uses procedural paradigm, supports events and has no support for objects. What makes small basic unique is that even though language itself has no support for objects, it can make use of external libraries with a construct similar to object method invocation! Hence these external libraries cannot be written in small basic. Keywords and variables are case insensitive in small basic. Use single quote prefix for comments. Small basic has only global variables. There are no subroutine parameters or local variables. Small basic uses dynamic type system. Variables are never declared and you can assign any value to variables. Small basic programs are executed from the first line of the program. To comment a line, start the line with a single quote. Small basic only supports global variables. Variable name should start with a letter and can contain letters, digits and underscores. Variables has no type and need not be declared. A keyword cannot be used as a variable. for, to, step, while and endwhile are looping constructs in small basic. Here is sample for loop which is executed from 0 to 100 and step indicates the increment after each iteration. Hence this loop is executed 10 times. Subroutines allows us to group a repeating part of code. It enables code reuse. In small basic, subroutines doesn’t support parameters or return values. Array is a special variable in small basic which can hold more than one value at a time. The values in the array can be accessed using an index or using a key (associative array). Multidimensional arrays are also supported in small basic. In small basic, API objects can have event handlers. You can pass subroutine names in your code as values for the event handlers and when the event is triggered, your subroutine code is invoked. For example, Timer object has a tick event to which you can add a subroutine. It will be invoked for every tick of the timer. Please also refer to the official getting started guide. GraphicsWindow Use this for drawing. Ideal for writing games! The type should be declared static. The type should have the attribute (annotation) [SmallBasicType] attribute. Once you create an assembly meeting all the conditions above, you can copy the dll into the “lib” folder under small basic installation. Usually this is located in “C:\Program Files\Microsoft\Small Basic”. If you need intelli-sense, create and copy the doc xml to the same folder. Copy the generated dll file to the lib folder (C:\Program Files\Microsoft\Small Basic\lib). Type in the following small basic program and execute it to see this extension in action! Is there a way to pass parameters to a subroutine in small basic? Why Johnny can’t code ? What are the variable limits, max string limit, long integers (as in vb6)?, is there a seek command for file position, what kinds of file I/O. A comparison with vb6 commands, etc. would be most helpful.